Please enter the personalization desired. Letters and numbers available. If you choose "choose your own" please also enter the 5 charms desired. 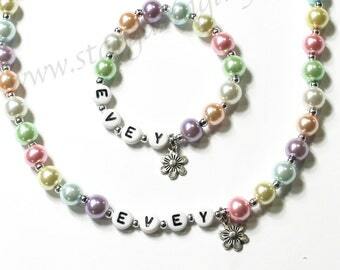 Personalized Charm bracelet with Name Bracelet. 5 Charm Bracelet. 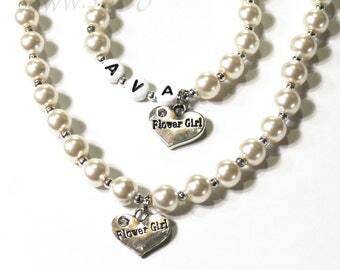 YOU CHOOSE up to 5 charms, pearl color, and personalization. Ballet/Dance, Irish/Celtic Dance, Nutcracker Ballet, Tennis, Softball/Baseball, Soccer, Sports, Cheerleading, Princess, Fairies, Snowflakes, Music, Love, Nature, Animals, Knitting, Sewing, Quilting, Western/Equestrian, Dentist/Tooth Fairy, Teacher, Hairdresser, Cooking, Celestial/Space, Nautical, or Create your Own!! ORDER INFO - For faster processing of your order please include the following information in the "message to seller" at checkout. 3. List up to 5 charms you would like OR select on of our suggested themes. This price EXCLUDES the Clay Minnie Mouse, Mickey Mouse & Bugs and our "premium" charms. Copy and paste the link below to see all of the different pearl colors and charm choices available. So Cute! A light weight, strong, stretchy bracelet for your child. Made to spell out his or her name, sport, or nickname of choice. Accented with beads. Bead color or dye lot may vary slightly from the ones shown. If you would like it made to complement your teams colors or your child's favorite colors please indicate so when contacting me with customization info. So so pretty! Can't wait to give it to my daughter after her recital. I know she will love it. 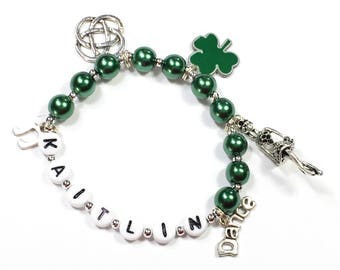 Soccer Charm Bracelet personalized with name. 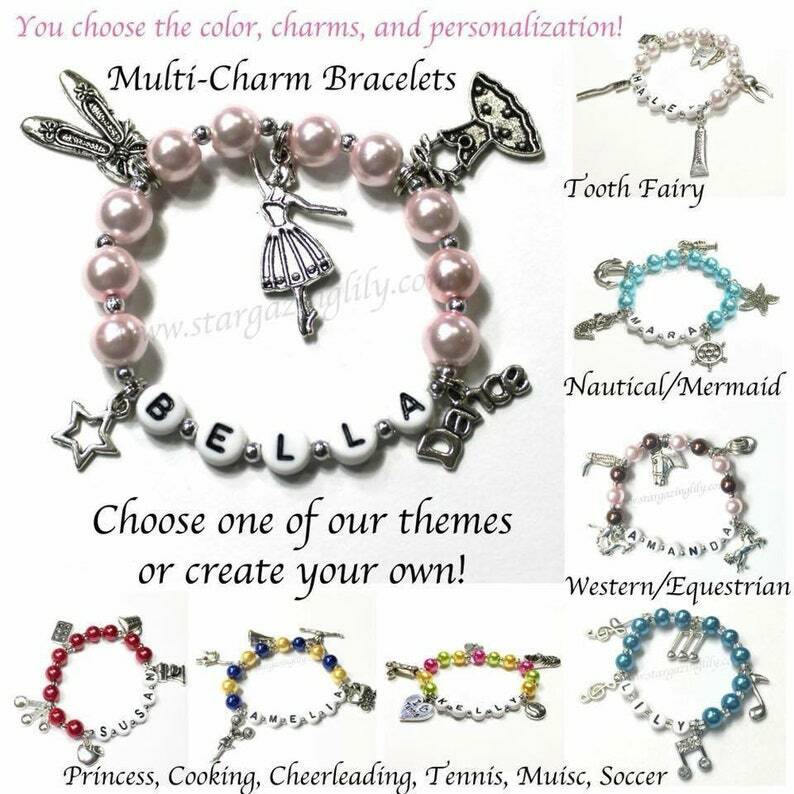 Multi Charm Bracelet YOU CHOOSE the pearl color, Jewelry Gift for a soccer player. Dance Recital Gift Crystal and Pearl Bracelet. YOU CHOOSE the pearl color. Pretty Ballet Pink Bracelet with bow. Ballerina Charm Bracelet.